Fortis Merchant Banking arranges EUR 250 million club deal for Resolution Shipping Ltd.
Fortis Transportation, part of the business unit Energy, Commodities & Transportation (ECT) with in Fortis Merchant Banking arranges and jointly finances one existing and two new building Windmill Installation Vessels. Resolution Shipping Ltd is a Cyprus based shipping company owning, a subsidiary of Vroon Group BV, and operates a Windmill Installation Vessel, the ‘MV Resolution’. The vessel is currently on time charter to Centrica (a leading UK utility company), installing wind turbines in the North Sea. This vessel is more efficient in the installation of wind turbines on a large scale than some of the other concepts currently operating in the offshore installation of wind turbines. Also, the offshore wind energy market is expected to make a quantum leap in the coming years. As a result the company has embarked on a new building program by ordering two new buildings. These new vessels will be built at Cosco Nantong Shipyard in China with delivery in 2011. The new vessels will be even more efficient with next generation equipment and fully fitted for stand-alone windmill installation as well as offshore capabilities. 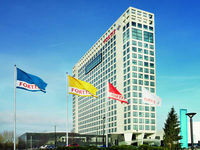 In order to finance the existing vessel and the two new buildings, Fortis Merchant Banking has arranged and structured a EUR 250 million club deal bringing in Commerzbank, Dexia Bank, Lloyds TSB and Rabobank. The facility consists of pre-delivery finance and post delivery finance. Fortis Merchant Banking managed to structure the transaction satisfactorily for all parties concerned, in spite of the fact that the offshore wind energy market is still in its infancy.